Why consider a filter cube from Chroma? A dichroic at 45 degree AOI in a standard microscope filter cube will typically provide blocking of approx. OD2 at the laser line. 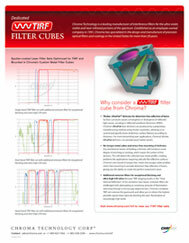 One good laser emission filter in the cube or a filter wheel will offer OD6-OD7. Additional blocking is most often required for optimal image quality in TIRF applications and easily verified by measuring the increased signal/noise ratio obtained when pairing emission filters. This can be accomplished using either a simple bandpass emission filter paired with a longpass emission filter in a cube mounted in the microscope turret, or a multi band emission filter in a cube paired with single bandpass emission filters in a filter wheel. Our complete TIRF sets remove the guess work and provide you with the tools to obtain the highest possible signal/noise ratios by blocking the laser illumination at exceedingly high levels. And Chroma’s UltraFlat dichroic mirrors mounted in our own metal TIRF cubes provide distortion-free reflection of lasers to give you the ability to create the perfect evanescent wave. Chroma offers our own brand of torque-free, metal microscope cubes to fit current Nikon, Olympus and Zeiss models. These cubes are necessary to house our 2mm or 3mm thick UltraFlat laser dichroics, as these thicker dichroics will not fit in the standard microscope manufacturer’s filter cubes. Our TIRF filter cubes affix the dichroics without the use of springs and clips and are aligned at Chroma using set screws to a precise 45 degree angle of incidence. The alignment may also be adjusted by the customer. Any mechanical means of holding a dichroic, such as springs or clips, will introduce some degree of pinching or twisting which invariably results in warping of the surface of the dichroic. This will distort the reflected laser beam profile, and will likely create problems for applications requiring critically flat reflective surfaces such as TIRF, STED and other Super-Resolution techniques such as PALM/STORM and structured illumination and some image-splitting applications. Chroma’s TIRF cubes enable stress-free mounting of dichroics, providing distortion-free reflection of lasers to give you the ability to create the perfect evanescent wave. Chroma manufactures UltraFlat dichroics for applications demanding superior levels of surface flatness. We also offer complete, assembled, catalog filter sets for various applications such as TIRF, super resolution and image-splitting, where distortion-free reflection is critical. These include dichroic mirrors with surface flatness values of <0.5 waves/inch Peak-Valley surface flatness and =/<0.1 wave/inch RMS. For explanation, see “how we specify surface flatness”, and see our surface flatness specifications below. In this context, surface flatness relates to curvature, and describes how curved the dichroic surface is. Surface curvature causes convergence or divergence of reflected light waves, depending on whether the surface is concave or convex. This results in reflected wavefront distortion (RWD) of whatever is being reflected: lasers, both in basic imaging applications and in more advanced methods such as TIRF and STED; structured illumination patterns; and reflected images in image-splitting systems. Sputtered thin-films exert stress on glass and fused silica substrates and warp them into varying degrees of curvature. Chroma has learned how to control this to a large extent by developing a proprietary manufacturing method which minimizes surface curvature. Another factor which reduces surface curvature is the use of thicker substrates which provide greater stiffness and therefore more resistance to the stress exerted by these coatings. The surface flatness of each lot of our UltraFlat dichroics is measured using laser interferometry. Possibly even more important regarding flatness is how the dichroic is held or housed. Even the flattest optics are warped by varying degrees when held in place by mechanical means. See “Holding Dichroics” below. Note: All laser dichroic part names begin with "ZT" prefix. Typically, our catalog dichroics for basic epifluorescence widefield applications ("T" prefix) are not controlled for flatness because non-coherent illumination does not require it. However, we do also offer standard widefield dichroics in UltraFlat versions with the specifications listed above. All choices available in shopping cart. The manner in which dichroics are held or housed in filter cubes can dramatically affect their actual flatness in real world applications. Major microscope manufacturers generally specify 1mm thick dichroics for their standard filter cubes, and these are often held in place mechanically, by springs or clips. Often, this is sufficient for holding 1mm-thick dichroics flat enough for routine laser applications such as confocal or epi-fluorescence using laser illumination, photo-activation and laser ablation. Our 1mm thick UltraFlat laser dichroics at better than 2 waves/inch Peak-Valley surface flatness provide the required flatness. However, any mechanical means of holding a dichroic will introduce some degree of pinching or twisting which invariably results in warping of the surface of the dichroic. For more demanding laser applications such as TIRF or STED, or for structured illumination and some reflected image applications, our thicker, UltraFlat dichroics can provide much better results. In order to optimally hold these dichroics, Chroma offers custom-designed and manufactured metal microscope cubes which fit most current microscope models and can accommodate dichroics up to 3mm thick. These cubes affix the dichroics without the use of springs and clips and are aligned at Chroma using set screws to a precise 45 degree angle of incidence. The alignment may also be adjusted by the customer. For workers with their own holders or mounts, we recommend that you hold by placing minimal pressure on the outside edges, rather than by pinching on the top/bottom surfaces to minimize warping. Call or email us to discuss the range of sizes and thicknesses we can provide. The surface flatness parameter we measure is referred to as “Peak-to-Valley” (P-V) deformation, and is expressed in “waves/inch” (or lambda/inch) as determined by laser interferometry. This measures the maximum deformation across the clear aperture of a dichroic, and includes the curvature (Power) plus any surface irregularities. Industrial standards for surface flatness measurements of flat optics, such as dichroics, conform to ISO standards, and are expressed in terms of interferometric “fringe spacings” or fringes. These are interference patterns which appear as a result of differences in index of refraction between that of the dichroic substrate material and air as a laser is reflected off of the measured surface. The number of fringes is used to calculate the deviation of the measured surface from that of a reference optical “flat”. We measure this using a wavelength of 633nm, which is the laser most often used in an interferometer. Occasionally, a filter manufacturer may express surface flatness in terms of radius of curvature (ROC), which in the context of flat optics is a more obscure and confusing metric. ROC is used mainly by lens manufacturers who deal with relatively large values for curvature. As an example of how our flatness specification relates to ROC, consider that a 0.5 wave/inch surface flatness is equivalent to a radius of curvature of 254 meters (or about 830 feet). ROC defines the radius of a sphere with a surface curvature equivalent to that of the measured optic. Others prefer the parameter of “RMS” (root mean square) which provides a measurement of the uniformity of the surface. Because any distortion to surface flatness as a result of the thin film coatings we use will be spherical distortion, this means that the RMS value will typically be approx. =/< ¼ of the of the P-V value. “RMS” will result in a smaller value than P-V to describe the surface of the same dichroic or mirror. For the same surface curvature, the various measured values for these parameters vary thus: P-V > Power >> RMS. Sometimes, P-V flatness is defined over a smaller area, such as a 10mm or 15mm clear aperture. The values listed above use the larger scale of 1 inch which results in a larger value for the same curvature. The relationship between measurement length and flatness is non-linear. Assuming the deformation is primarily spherical curvature due to coating stress, this can be described by a simple quadratic formula. To calculate the equivalent flatness for a clear aperture of ½ the measured value, the flatness expressed as number of waves will be ¼ of the measured value. As the denominator in the expression (inches) varies by “x”, the numerator (waves) varies by x2. An optic which measures 2 waves/inch P-V will measure 0.5 waves/0.5 inch P-V. If you prefer the surface flatness expressed as Surface Power or RMS, we will provide this upon request. Finally, remember that the method of holding or housing the dichroic will greatly influence its actual flatness when used in an imaging system.